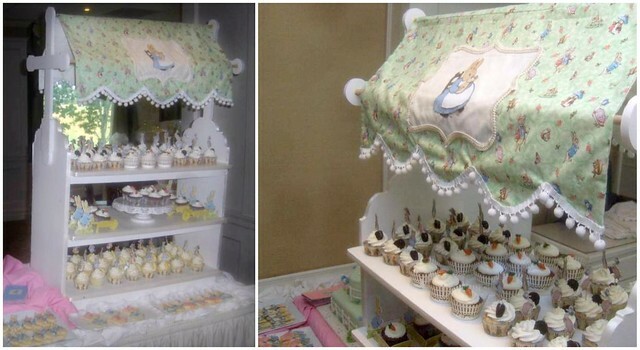 She also made a Beatrix Potter awning for her notorious dessert table shelf display. 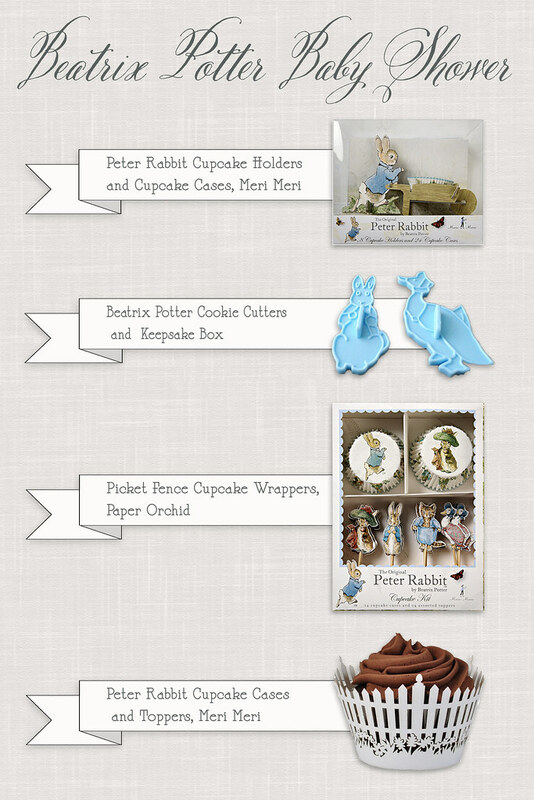 The shelves were stocked with lots of cupcakes in The Original Peter Rabbit by Beatrix Potter Cupcake Holders, Cases, and Wrappers by Meri Meri as well as the Picket Fence Cupcake Wrappers. 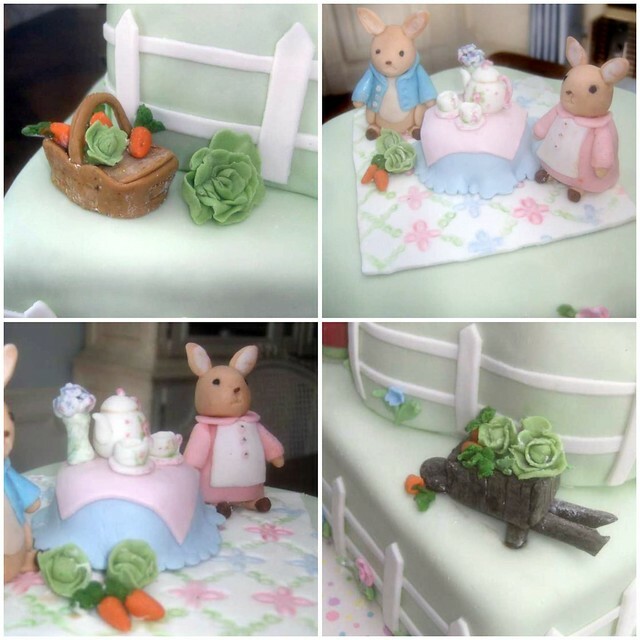 Here is the Beatrix Pottery Baby Shower Cake with Peter Rabbit, Mrs. Rabbit, Jemima Puddle-Duck, and Mr. Jeremy Fisher characters made out of fondant. 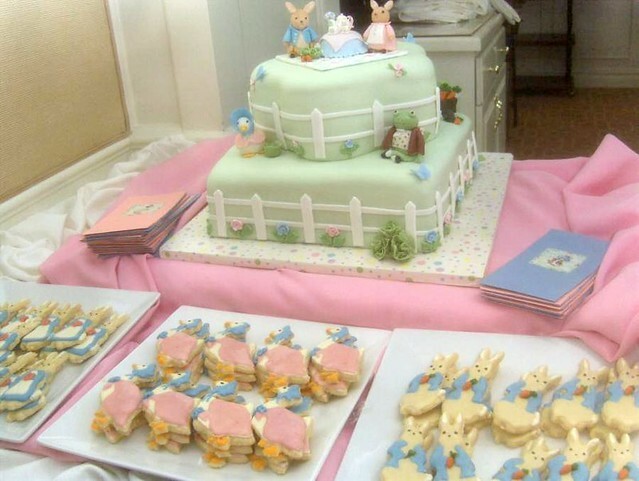 There are also cookies on this dessert table of Jemima Puddle-Duck and Peter Rabbit decorated by my mom. Here are some close-up shots of the cake. I love the lettuce and carrots in the picnic basket and wheel barrow. 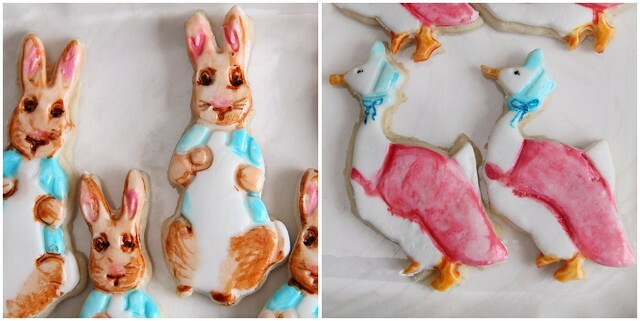 I made Peter Rabbit sugar cookies and Jemima Puddle-Duck sugar cookies that the guests took home as party favors. These are the ones that I decorated. 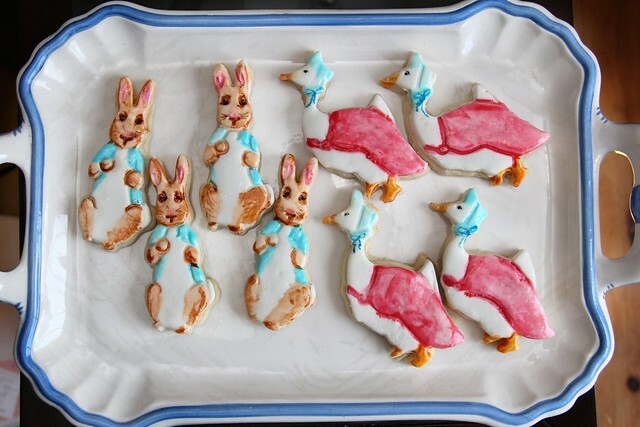 We used the Beatrix Potter Cookie Cutter (from the Keepsake Box) to make these. They were kind of tricky because of the delicate limbs. The cookie dough really wanted to get stuck in the plastic cookie cutters. It took a little extra flour, freezing, and patience to get them done -- but I think they were worth it! 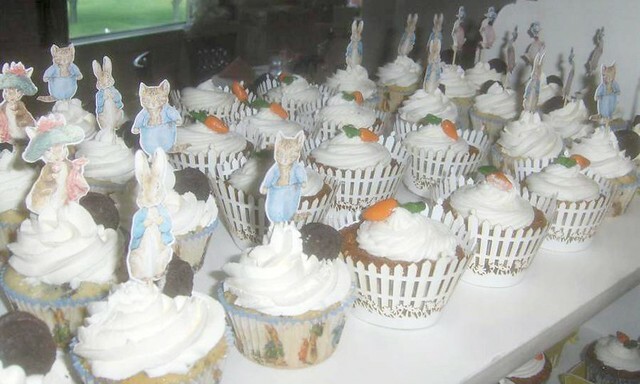 I covered them with fondant and hand-painted them. They ended up looking like the porcelain figurines. It was kind of a happy accident. 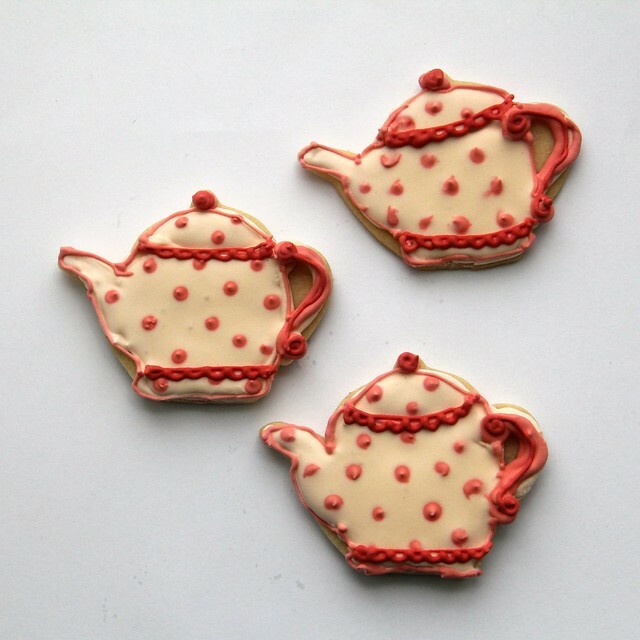 I also made a couple of teapot sugar cookies decorated with royal icing. 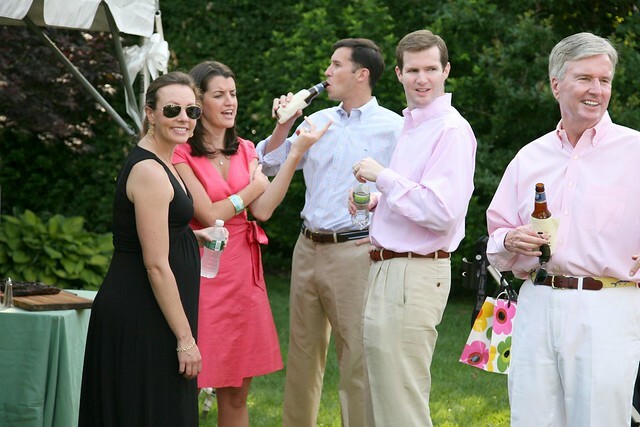 We're very happy and excited for Justine (in the picture below in the aviators) & Brendan (2nd from the right) & ALL the Groarke's about their new family member on the way! Can't wait to see pictures and find out if Baby Groarke is a boy or a girl!